THE George Mukoya and Muduva Nyangana conservancies in the Khaudum north complex of Kavango East region, have been experiencing increasing cases of human-wildlife conflict, mainly involving elephants which damage water infrastructure. According to the Namibia Nature Foundation (NNF), the two conservancies are constructing ring trenches around six identified water points in exclusive wildlife zones in a bid to reduce this conflict. These ring trenches are stone walls built around water points to prevent elephants from damaging water infrastructure. Trenches at two water points have been completed so far. This programme is supported by the Ministry of Environment and Tourism and the NNF, with funding from the German government, facilitated by the Deutsche Gesellschaft für Internationale Zusammenarbeit (GIZ). “The two conservancies are fully engaged on this assignment. They are involved in planning and carrying out the actual construction, including the responsibility of collecting stones and construction of the trenches,” said NNF which added that in return they receive an income. Institutional support from government ministries, NGOs, donors and the private sector towards community development initiatives plays a crucial role in bringing positive change within communities and empowers conservancies to join hands and take collective action on the natural resources around them. “It is for this reason that NNF, has been working with the MET and the Ministry of Agriculture in these conservancies since 2010, providing institutional support, natural resource management and biodiversity conservation, as well as enterprise development for direct benefits to the local communities,” the NNF said. 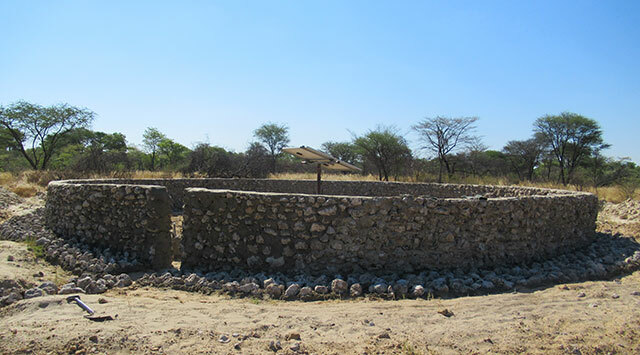 For the construction of the ring trenches, the Directorate of Wildlife and National Parks, in the Kavango East oversees the construction and the transportation of the stones from where they are collected to the construction site. The NNF uses funds provided under the German-Namibian cooperation to purchase the necessary materials and pay community members who build the trenches. Additional funds are used to provide technical support to conservancies in the Kavango East and West regions to manage their natural resources. The NNF also received a loaned Ford Ranger double cab vehicle from the Ford Wildlife Foundation in September 2018, for promoting environmental sustainability along with community participation in the conservancies. This enables the project coordinator to attend meetings with community members and conduct site visits. The chairperson of the George Mukoya conservancy, Jacob Hamutenya, remarked: “For us to be a community that we ought to be, sustainably developed and with well managed resources, it is necessary that we join forces with relevant public and private agencies.” Hamutenya added that the ring trenches assignment is a great example of collaboration, as it brought these two conservancies and support organisations together in pursuit of one aim – to reduce human-elephant conflict.